There is no such thing as a sure bet in the NFL, especially in the playoffs, especially on the road. Seattle may have a comparable offense to Washington, a better defense, and better special teams, but the only thing that will matter come Sunday is which team plays better on that day. The Redskins pose real challenges to the Seahawks, especially on offense. If Washington were to win this game, it would likely be due to one, or more, of the reasons below. There is going to be plenty of talk about the zone read option offense that both Seattle and Washington employ, but there is a different sort of zone offense worth watching. The Redskins get a number of their big plays on drag routes or deep crosses behind the linebackers when facing zone coverage. Seattle plays a lot of zone coverage, and has been exposed on occasion by offenses that hit those plays with accuracy and timing. One particular play stood out in watching film on the Redskins. It showed up in multiple games, and was open much of the time. Below are two examples of it run against the Steelers. First, tight end Logan Paulsen leaks behind the linebackers for a 30+ yard gain. You will notice the formation is essentially identical for this next play, but receiver Niles Paul drags all the way behind the linebackers from the other side to catch the ball in the exact same hole in the zone. Another big gain. Seahawks linebackers will have their hands full trying to contain Alfred Morris and RG3. Their instincts will be to step forward on play-action, and that will create large gaps behind them for the Redskins passing game. This is the fundamental tenet of how Washington schemes on offense. The Seahawks can choose to man up on defense, but that could mean relying on Marcus Trufant to cover crossing routes he has not proven capable of doing this year. Seattle safeties will need to diagnose and defeat these plays no matter how Seattle chooses to defend them. Earl Thomas has the speed to close and Kam Chancellor can make receivers regret running across a zone, but both will have responsibilities against the run and the deep ball. Tough stuff. He has great footwork, and is always throwing from a solid base. If he regains his speed this week, which seems far-fetched given how he looked against Dallas, Seattle will have its hands full. This offense becomes a very different animal when Griffin is a threat to take off. Even with that ability reduced, Griffin appears to be the type of player that will raise his game in the playoffs. No stage is too big for him. He will be facing the best secondary since going up against Atlanta and Pittsburgh. Both of those teams caused problems for the Redskins passing attack, but Griffin has gone over 100.0 in passer rating in five of the last six games while throwing for 12 touchdowns and just 2 interceptions. This may be obvious, but it cannot be overstated. This is the single biggest advantage the Redskins bring to the table. This game would not be close in Seattle. Washington has not hosted a playoff game since 1999. They have terrific fans who live and die burgundy and gold, and will be frothing at the mouth by game time. The atmosphere will be unlike anything the Seahawks have faced so far this season. Chicago is not a friendly place to play, but the Seahawks have practically set up residence there after playing four road games in Chicago in the last three years. Keep in mind, Seattle won each regular season game in Chicago, but got blown out early in the 2010 playoffs. Everything changes in the post-season, and this young Seattle team will need to have their armor on to absorb the initial shock wave. The advantage is more than just screaming fans. The turf in Washington is not great, and the Redskins players are accustomed to it. Chicago has notoriously bad turf, but adjusting to the field in Washington could cost the Seahawks early, and make the game more difficult than it might otherwise be. The Seahawks are the second-youngest team in the NFL. Earl Thomas, Russell Okung, Marshawn Lynch, Marcus Trufant, Leroy Hill, Brandon Mebane and Chris Clemons played when the Seahawks went on the road in the playoffs to face the Bears in 2010. Trufant and Hill may not even play in this game, depending on coaching decisions. This is really the first playoff game for this team. Going on the road, across the country, is daunting for any team, let alone a green one. This particular group of young players has proven to be precocious in a variety of ways, including their attention to detail during game prep. They play with passion, ferocity and fearlessness that should lend itself to overcoming any early jitters, but as Pete Carroll says, you need to accomplish something before you can feel confident about doing it. Seattle has not won a road playoff game yet. They can prepare for it, but they won’t know they can do it until it has been done. Look at the Chicago game as a perfect illustration of how accomplishment can breed confidence. Should Seattle win this one, any future road game becomes that much easier. I shared this info in my last post, but it bears repeating. 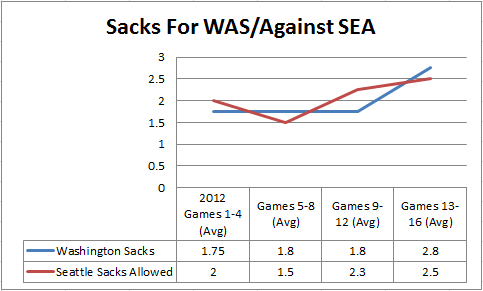 The Redskins have been increasing their sack totals while the Seahawks have been surrendering more sacks. Sacks equal turnovers for the Redskins so far this season, and turnovers lead to wins. Seattle will be starting rookie J.R. Sweezy at guard who has been great at run blocking, but has been susceptible to bull rushes and miscommunications on blitz pick-ups or line stunts on pass plays. You can bet Jim Haslett has seen this and will be attacking Sweezy with everything he has. Don’t be surprised if John Moffitt is left active for the first time in three weeks to hedge the bet. The coaches had been rotating Moffitt and Sweezy for a few weeks before handing the job to Sweezy versus San Francisco. Moffitt has not been great in protection either, but is a smart player who will at least be where he is supposed to be in the blocking scheme. The Redskins lack the edge rushers needed to recreate what the Rams did this past week by collapsing the pocket while also getting a strong inside push. Expect Haslett to use linebacker and corner blitzes to keep Russell Wilson in the pocket. Wilson has gone up against a blitzing defense with the likes of Arizona, but has not faced a team that will gamble the way Haslett has started to. If Wilson remains hesitant to check the ball down, he will hurt his team’s chances. This is a game that will require quick decisions. Seattle has allowed five teams to rush for over 100 yards against them. They are 3-2 in those games. The Seahawks have allowed over 150 yards rushing three times, and are 1-2 in those games. The Redskins have rushed for over 100 yards in 15 of their 16 games, and rushed for over 150 in 11 games. Seattle’s rush defense has been exposed more often than the Redskins rush offense has been slowed. If I’m a Redskins fan, this is where I feel most confident in my team’s match-up with the Seahawks. The Redskins enjoy a major advantage in playing this game at home. Their fans will be rowdy, and their players will have an extra hop in their step. They have an offense that emphasizes things Seattle has struggled with at times in terms of zone coverage and rush defense. Washington has a great offense, a great quarterback, and a good team. It will take a great team to beat them on the road. Seattle has what it takes to be that team, but will have their work cut out for them. The Hawks had a checklist of things they needed to work on and overcome from the beginning of the season. These included third down conversions, red zone scoring, etc. The one thing they have not overcome however is the ability to stop opposing teams in the 4th quarter on the road with the game on the line. Games against Arizona, Detroit, Miami, and Chicago all come to mind. Given the likely scenario that this game will come down to the wire I have a sinking feeling that the Hawks defense will not be able to take that next step in the most crucial of moments.